The Nigeria Army has unveiled Egwu Eke III (Python Dance) as part of effort to curtail kidnapping, cattle rustling and armed banditry in Katsina State and its environs. The Chief of Army Staff, Lt. Gen. Tukur Buratai inaugurated the new measure Saturday, noting that it aimed at revamping the already existing operations of the Nigeria army all over the country to tackle heinous crimes. Buratai said it became imperative to close the gaps between existing operational bases to avoid criminals and bandits escaping from one operation theatre to another without being notice, hence the launching of the operation. He urged the troops â€œto be courageous, focused and work hard in synergy to end the problem of insurgency, kidnapping and banditry confronting the nation. 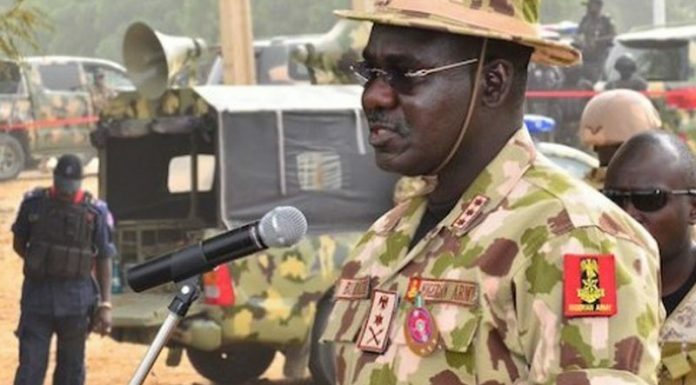 Buratai, who was represented by the General Officer Commander 8 Division, Maj.-Gen. Steven Olabanji, said the Nigerian Army had resolved that no hiding place for criminals terrorising innocent people in the North-west. Buratai reminded the troops of their professional responsibility to defend the territorial integrity of Nigeria as well as security of lives and property of the citizenry. Earlier, the Commander, 17 Brigade of the Nigerian Army, Brig.-Gen. Lukman Omoniyi said the operation Egwu Eke III â€œis to compliment already existing operations of Sharan Daji and Mesa in the state. Also yesterday, the Katsina State Government said it would put an end to the issue of insecurity relating to kidnappings, banditry and armed robbery facing the state soon. The Secretary to the State government, Mustapha Inuwa disclosed this at the end of a strategic meeting with the Nigerian Army held at the 17 brigade in Katsina. He added that the Katsina State Government â€œis very much passionate about ending insecurity. We have been working with the security agencies. We realize we still have more with recent insecurity which it rate is very alarming. â€œIn continuation with the Sharon Daji, we are bringing the Nigeria Security agencies and other security agencies to have a United and weâ€™ll coordinated operation. I believe very soon the issue of insecurity will soon be over in the stateâ€.